Enter our Picture Frame Ornament Contest, by answering the question, below (see ***). 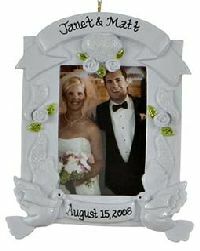 You may win this lovely personalized Wedding frame ornament from Ornament Shop.com. This online shop has a great assortment of ornaments, gifts, and decorations. *** ENTER HERE: Please Answer the following question. • Displaying ornaments is a meaningful custom for many. What other holiday tradition would you like to include at a Winter bridal shower? Share it! • Ornament Shop.com is your one stop shop for over 3,000 unique ornaments. They have a great variety of affordable personalized pieces. Materials to choose from include ceramic, glass, dough, clay dough, metal, and resin. Whether you shop by holiday, activity, theme, sport, college, pets, or other category, you're sure to find the perfect idea. *** Enter our Picture Frame Ornament contest. • What other holiday tradition would you like to include at a Winter bridal shower? Share it! Please give your holiday tradition idea a title.